Russian President Vladimir Putin, left, and U.S. National security adviser John Bolton greet each other as Russian Foreign Minister Sergey Lavrov, center, looks on during the meeting in the Kremlin in Moscow, Russia, June 27, 2018. 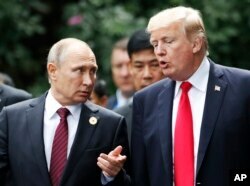 U.S. President Donald Trump and his Russian counterpart Vladimir Putin have agreed to hold their first formal summit in the coming weeks — with a final announcement of the timing and location of the meeting to be announced simultaneously by the White House and the Kremlin on Thursday. 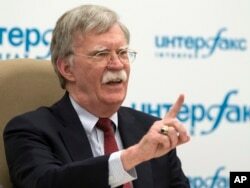 The summit confirmation comes amid a high profile visit by Trump’s National Security Advisor John Bolton to Moscow, during which Bolton made clear he met with President Vladimir Putin and other top Russian officials to hammer out the summit agreement at the behest of the American leader. “President Trump asked me to come and speak to Russian authorities about the possibility of a meeting between him and President Putin,” said Bolton, speaking at a press briefing with international journalists in Moscow. U.S. National security adviser John Bolton gestures while speaking to the media after his talks with Russian President Vladimir Putin in Moscow, Russia, June 27, 2018. Appointed as a White House National Security Advisor just last March, Bolton — observers noted — made for an odd messenger for friendship with Moscow. The former Bush administration official has long been regarded as a Russia ‘hawk’ and one of the Kremlin’s harshest critics over election interference, arms control, and other issues. Yet challenged by reporters over his past statements — including calling President Putin a “liar” — Bolton claimed his past statements had no place in his current role as National Security Advisor. “Right now I’m an advisor to President Trump. It’s his agenda that we’re pursuing and that’s the agenda I intend to advance,” said Bolton. The summit is all but certain to intensify scrutiny of the White House’s relationship with Russia amid ongoing U.S. federal investigations into contacts between Trump’s presidential campaign and Kremlin-linked officials on the road to Trump’s 2016 election win. While the White House and the Kremlin have repeatedly denied those charges as a “witch hunt,” both sides recognized the shadow the investigation has cast over attempts at detente. Bolton, who last year called Russian election interference “a true act of war,” seemed to toe the Trump administration line Wednesday, at least as far as any possible collusion between the president's 2016 campaign and Russian operatives. Indeed, that point was stressed by President Putin in brief comments before cameras as talks got underway. “From the beginning, it, unfortunately, must be said that Russian-American relations are not in the best shape,” said Putin in addressing Bolton. Hovering over the next few weeks will be questions over what concrete deals can be hammered out given the summit's short notice. Observers note that most presidential summits take months of planning and negotiations to present the right ‘optics’ and ‘deliverables’ worthy of a meeting at the highest level. Bolton said he expected follow-on discussions between Secretary of State Mike Pompeo and his Russian counterpart Sergey Lavrov to address those issues in the coming days. The two sides will certainly have ample topics to choose from. Both Washington and Moscow have expressed a desire to find common ground on issues such as arms control and combatting terrorism. More vexing have been the fallout in relations over Ukraine, Syria, western sanctions, and allegations the Kremlin was responsible for the poisoning of a former Russian spy on British soil last March. 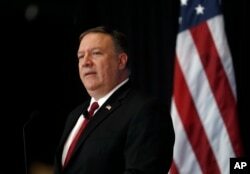 But Bolton eschewed concerns that the summit would produce little of substance: “I think the fact of the summit itself is a deliverable and I don’t exclude that they will reach concrete agreements,” said Bolton.